We pack each bulletin with Bible-based games — four panels of puzzles, word searches, seek-and-finds, dot-to-dots and more — which children love! Customize bulletins with your church's name, address and other contact information — even a logo or other image — so that when children take them home, the bulletins become reminders of their home church. There's a large variety of bulletins to choose from — there are familiar stories from the Old Testament, the Gospels, the Epistles and Special Days. You'll find a bulletin to match lectionary readings, specific Scripture passages or keyword topics. 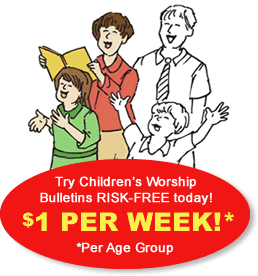 There's no better way to see for yourself how much your children will love Children's Worship Bulletins than by using them. In this short article, we've outlined two example Sunday school activities about Solomon that you can use in Sunday school this week! Sunday school activity about Solomon for ages 3-6: What did Solomon ask for? Ask the children to think of something that they want more than anything. Stimulate the conversation by suggesting things like getting the latest video game, being the fastest runner and other seemingly desirable things. After giving the children time to think about what they might really want, hold up the poster depicting the winner's medal and ask how many would want to be the fastest runner, the best basketball player or the best at something. Gather those children in a group at the front of the classroom and ask one of them to hold the poster depicting the winner's medal. Next, hold up the poster depicting several birthday cakes and ask how many would want to have lots and lots of birthdays, to live a very long time or to live forever. Gather those children in a group and ask one of them to hold the poster depicting the birthday cakes. Finally, hold up the poster depicting a treasure chest and ask how many would want all the new video games, a new bike, new toys or more money than they could ever spend. Gather those children and have one of them hold the treasure chest poster. Ask if anyone can think of something that they'd want more than riches, want more than a long life or want more than being the best at something. Have the children return to their seats, and read 1 Kings 2:10-12, 3:3-14. After reading the story, ask the children to imagine that, in their dreams, God offered to give them anything they wanted. Engage them in a conversation about why the things they thought they might want would not make them happy forever (batteries eventually become depleted in video games or money can't buy everything, etc.). Ask if having any of those things would allow them to give God glory. Gently remind them that their choices could only make them happy for a short time. Ask the children why asking for wisdom would please God. Have the children complete the bulletin to reinforce the lesson. Sunday school activity about Solomon for ages 7-12: Then Solomon stood before the altar of the Lord … and What else did Solomon say? Divide the children into two teams. Have each team select a secretary. Explain the activity, "We're going to learn about Solomon's prayer at the altar of the Lord by solving the puzzles 'Then Solomon stood before the altar of the Lord ...' or 'What else did Solomon say?' Everyone on the team should work together to solve the puzzle. Have the secretary of your team write the answers their team gives onto one page to hand in. When I yell, 'GO!' the first team to finish its puzzle wins." Assign each team one of the puzzles to complete. Have the winning team read their solution. Check to be sure that it is correct, and then award prizes to the winning team. Read aloud 1 Kings 8:1-11, 22-30 and 41-43 to reinforce the lesson.